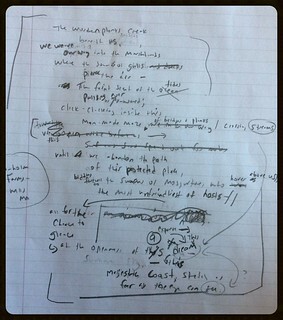 Kevin's Meandering Mind | Digital Poetry: What Happened Here? And also into all the strange spaces in-between … and more importantly, I want think about what we mean when we say Digital Poetry or Digital Composition, and what do digital opportunities do to the ways we compose. This is not a throw-away question. Our students are writing all the time, and doing so in interesting ways outside of school. We don’t often think of it as “writing” because it falls outside our traditional, constrained definitions of what writing is. But they are composing with video. They are composing with video games. They are composing with mixtapes, with memes, with image altering apps. They are composing with online comics, with remixing, with screencasting. They are pushing writing beyond the paper and pen. If our students are pushing up against the edges of composition, we should be pushing edges, too. Or at least, that’s my view. If we want to be their guide into the way people compose, we need to be writing in different spaces ourselves, experimenting with writing, and discovering the learning possibilities. This is one of those experiences you really can’t view from afar, and judge the merits of. You have to dig in and do it. You need to write digitally. This comes with a boatload of questions that orbit around a single idea: What is digital writing? I don’t quite know, and I’ve been thinking and tinkering with it for years. There was a question early on in my poetry project in which I shared two visual versions of a draft, and someone asked (quite rightly and quite politely), Why is THAT digital writing? I made a weak argument (as I now think of it) that the two images actually framed the same words in a different light, bringing to the surface a new way to look at written words of the page. Yeah. Maybe. I don’t know. It was only when I got past my rough draft stage (that first image above) and final draft stage (that second image above) that I began to delve deeper into digital poetry and its possibilities. 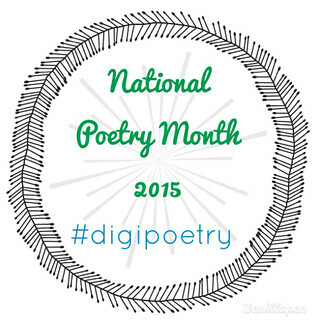 Here in this stage, I argue, the digital aspects “transformed” the poem in new ways. By using the same poem as my anchor text, the use of various digital tools and apps and spaces allowed me to make something new — with echoes of the original always intact — and provide another road into understanding what writing is and is becoming. This inquiry is goes to the heart of digital writing. It’s not just taking something and keeping it the same with bells and whistles so that it “looks” shiny and new. Digital writing should alter our perceptions of the text, both as the reader AND as the writer. This two-sided coin is important, as we want to think of how our writing changes just as much as the reading experience changes. So, for me, when I created a Soundscape story with no words at all in the file, yet words imposed as floating comments; or made a digital story, juxtaposing text and narration with image and music; or when I reframed the words of the poem as art; or when I found a new poem inside the old poem and asked the reader to click the button that dropped words out of sight — these were all decisions that I made to make something new (or at least, attempt to do so). If you buy my argument (and you may not), then what are the implications for the classroom? 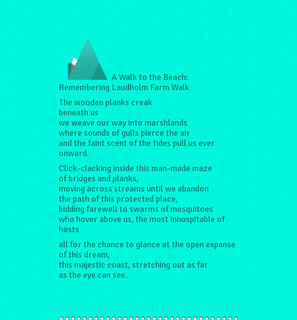 For me, this kind of experimenting — of taking a poem for a walk — allows me to experience possibilities for my students as writers/composers. I am my own guinea pig. I can see that the remixing with Thimble would take time and lessons around coding. I can see that the digital story app would be great to use (if we had iPads). I can see that the site that allowed me to twist words into a shape … we can do that. Using Notegraphy app for a polished-looking final copy? Yep. Introducing soundstories and podcasting? We’ll be there soon enough. And here, I have my own mentor text to show students (who saw me writing the first draft with them and who have seen the final version that I shared the following day but have not yet been shown the extended remixes). Digital writing not only transforms my own writing process, but it also has the potential to transform my teaching practice as well. The hope is that it may transform my young writers, too. Thanks for coming along with me on this journey of poetry and reflection. I’d love to know your thoughts on what digital writing is, and isn’t. It’s a term still very much in flux. Kevin, You get to the crux of what I grapple with when I think about digital writing in the elementary grades. I always go back to what Troy Hicks says that our students become not only writers, but also sound recorders, digital designers, artists etc. I agree with you that it’s important for us as teachers of digital writers to be digital writers ourselves so that we can think about the process and how that applies to our students. I think when we think about the way you have here, we transform ourselves into people who use text to create new ways of thinking. If I don’t practice that how can I expect students to get it? I always get one or two students who do something new with words, who discover it while they play. We need to play with our words using different technologies. Thanks for this very thought providing post. Led Zepplin – Just a band. Radiohead – Are just a band. The next big thing – JUST A BAND. Just substitute “just a tool”. Pespective. Anti-spam? Hart node. I live in Hart County KY. I am a hart node. A hart is also a word for a male deer, a stag. Betterer and betterer and creepier and creepier.